you all know about my handspun EZ snail hat. well, now there’s another fabulous snail hat in the blogosphere. which makes me want a whole legion of handspun snails. can you imagine how happy a place the internet (and real world) would be if only there were a bunch of these around? p.s. join and talk about it by blogging, tweeting, mentioning it in a forum, or inviting others to join and i’ll enter you in a drawing for a skein of my handspun! be sure to come back to this thread and comment to be entered. you have until tuesday the 7th at 5 pm eastern time. 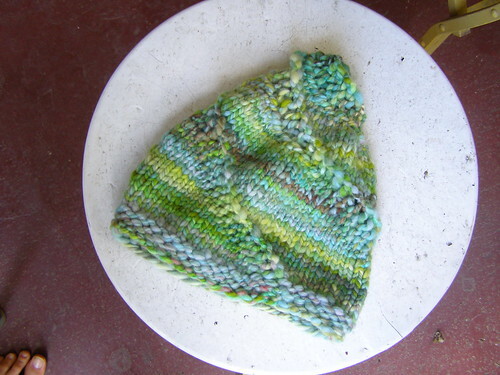 This entry was posted in community, cosyspins, handspun, hats, knitting, spinning by cosymakes. Bookmark the permalink. I think I have some perfect handspun for this. Fun! EZ’s snail hat is also in “The Opinionated Knitter” around page 94-96. I am very excited and will be knitting along in my own handspun. I also RT’ed your tweet about this contest/knitalong. I just joined in the cosymakes group on ravelry :) I’m excited! Looking forward to this one, I’ve not knit one of these before. Thanks Cosy! hi Cosy – I posted to my blog a few minutes ago. I figure I’ll do some updates, too. This is so cool! I have enjoyed looking at your blog and shall have a go! Looking forward to a chance of a prize! Great idea – EZ and handspun! I knew I had been carrying around Vogue Knitting’s winter 09 issue for some reason…….to make the EZ Snail Hat:)…..getting a chance to win some delicious handspun is a bonus! Pingback: do stuff! » so much spinning! Hey, I’m really enjoying your site! I’m hoping you might be interested in a great craft show near me, the no coast craft-o-rama in Minneapolis. I not involved – just a shopper who thinks you’d be a good fit! I’ve enclosed a link – love the snail hat! Pingback: do stuff! » Portland sale and project, and yarrrrn!